FQCD500H Computer Rolls-Connecting and Dots-severing Vest Bag Making Machine-Sanyuan plastic packing machinery co.,ltd. Automatic Roll Changing Plastic Vest Rolling Bag Making Machine is with Film wrapped and then exporting standard wooden case, 6 machines can be loaded in a 40 ft container, one year guarantee time, whole life technician support, a set of tools, a box of vulnerable parts, English operation manual. Within 45 days after receipt of 30% payment by T/T. It is suitable for dots-severing & cutting all kinds of plastic film and color film. It is an ideal equipment for roll bag, trash bag, table film, flat bag, etc. Photoelectric control feeding system: It adopts photoelectrical cell control unwinding. If lost sign, machine will stop automatically. It adopts double working position for winding, unwinding and sealing. It adopts computer to control. It can set bag length freely. Easy operation, stable function and good sealing properties, suitable to make garbage bag. 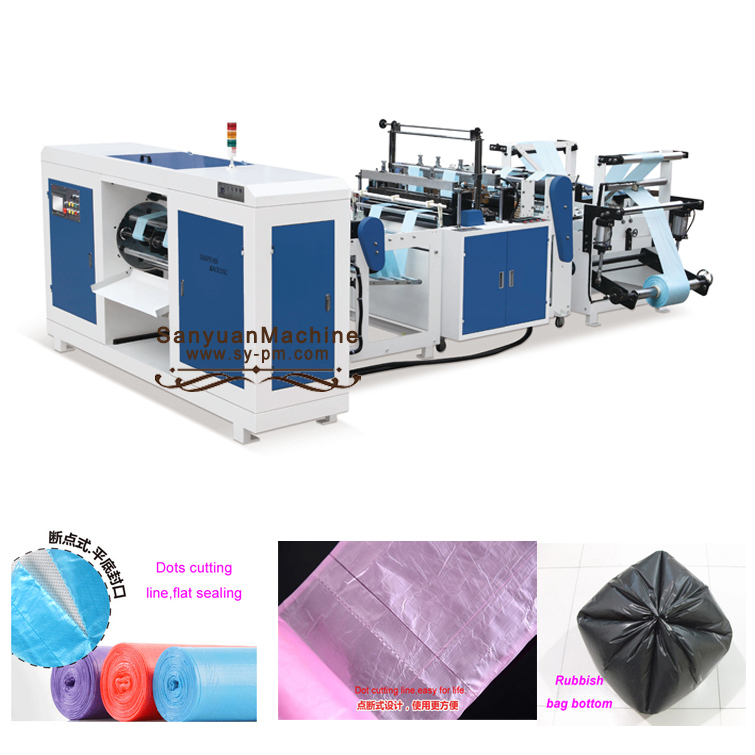 Multi-function, by changing the dot-severing knife into flat knife,and change rewinding stand into flat platform, this machine can also make bottom sealing and cutting vestbags.